Sam Jones spent his boyhood in a small city tucked away in the segregated south. In many ways, it was the most unlikely of settings for the start of a professional sports career marked by a rare kind of success. Guided by humble beginnings and values that included hard work, maturity, and respect, Sam soon discovered how much those early preparations would mean in the future as he entered college and set out on a trajectory that would eventually intersect with the Boston Celtics and produce astounding results. 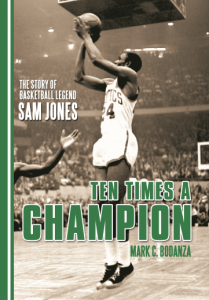 In his biography of the basketball legend, Mark Bodanza chronicles how Jones overcame obstacles on and off the basketball court to capture the attention of the Boston Celtics—fresh from their first NBA championship—and become a surprising first-round draft pick in 1957 and, for the next twelve years, one of the game’s greatest champions. As Bodanza reveals Sam’s ultimate challenges and joys, it soon becomes evident that Jones was an extraordinary testament to what can be achieved through perseverance, integrity, and a faithful and determined effort, not just for himself but for the benefit of his team.